I place a wee-mail above Legless’s ancient message. No need to sign it because every dog has a unique aroma. It’s the same wee-mail I’ve left whenever I’ve had the chance to pee. It conveys my shame. I ask one question: who killed Professor Patrick Salt? I hang my head and tuck in my tail as I plod after Rose. She’s investigating his murder, but little does she know, so am I. I failed Paddy in life and I have vowed I will not fail him in his death. Monty the dog has just arrived at his new home. His new owner, Rose, is very caring, and Duckdown Cottage seems a nice place to live. But Monty can’t be happy here until he finds out who killed his former owner, Professor Salt. Monty was there when it happened and, even though he was injured trying to protect his owner, he still feels responsible for not doing more. He’s going to track down the killer. Rose, meanwhile, wants to find the killer, too. She is a trainee detective, involved with the police investigation into Salt’s murder. But she has accidentally mucked up another investigation and now she’s in trouble at work. Perhaps if she can solve the Salt case, she can redeem her reputation. Monty and Me is a mystery story with a difference: the narrator is a dog. Monty can’t speak to Rose (or other humans) but he can understand them, and read, too, and he finds ways to get his message across to Rose. He is helped by a rat, a magpie, and a lady beetle, among other animal accomplices, as well as by Rose, who comes to realise that Monty is pretty special. 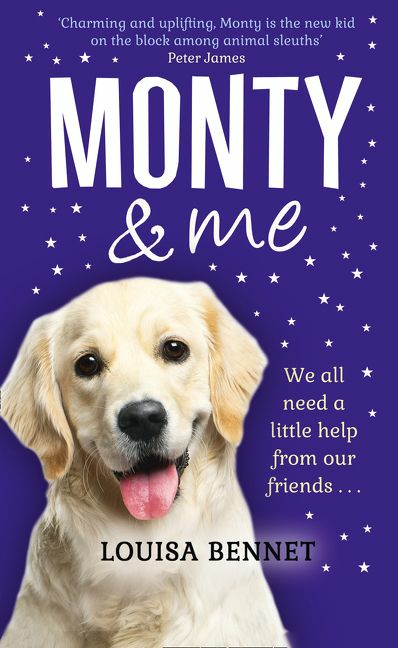 Although a story from the dog’s perspective may sound like a children’s book, and the cover will certainly appeal to young readers, Monty and Me is intended for adult readers, and will most appeal to those who can suspend disbelief and enjoy the novelty.